If anybody knows what the Icelandic word for grand-daughter is, let me know. Anyway, I got a serious amount of knitting done, about four inches. I even knit in the dark car, and only had a few mistakes in the 10x1 rib. Easily fixed when we stopped for supper in Cabazon. 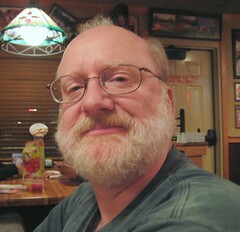 I'm super tired, though... Hope to add a picture or two tomorrow. Here's a picture from a couple of weeks ago, when I went to a library colloquium for a consortium of small private colleges who use big words to describe themselves. ahem. 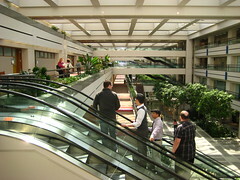 This is the atrium in a building at Loyola Marymount University, originally an office building for Hughes Aerospace. It does look very mid-century modern, doesn't it? The building is HUGE - at least two football fields long, and four stories tall. You can see all four levels-- this is taken from the third floor. OK, I admit- it doesn't have much to do with anything fibery. 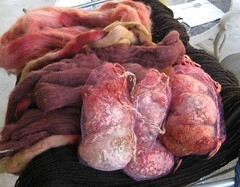 It's just eye candy so I don't bore you to death when I say I combed two and a half more ounces on the Stardust fleece. This has been a wonderful eight years- I can't believe how lucky I am to have found you. I took this picture about a week ago-- Mike made a comment about actually behaving himself, and I got a picture! He didn't even flinch when I bought all those fleeces. Wow. I have been working diligently on combing locks of Stardust's fleece, and I now have 16 ounces done. One pound down, one to go. It's all good. This is what I pulled out of the Clown Dyepot last weekend. (sorry to be tardy getting the picture out of the camera and online... I think I'm still working through the aftereffects of buying so many fleeces!) On the bottom right are "teabags" with mohair, then a couple of wool rovings, and a skein of Henry's Attic mohair yarn at back. Those rovings in the middle are both overdyes - one is some white that I dyed a long time ago and really didn't like the color, and the other is red dyed over a grey roving from Brown Sheep Yarn Company. I thought I'd share a good picture of the JoJo puppy. She's a Great Pyranees, 12 years old, and getting skinny in her old age. 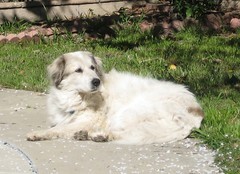 12 is huge for large breeds... Those are apricot blossoms all around her. She's a wonderful dog, and I love her to pieces. 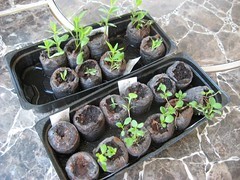 These are the seedlings I finally got potted today. One flat is madder and the other is indigo. There are two different indigos here- Indigofera and Polygonum. The Polygonum is obviously more vigorous than the Indigofera! I don't have a picture yet, but have combed about 14 ounces of the Stardust fleece. Oh, it's yummy! I'm almost halfway to my goal, combing 32 ounced before I start putting it through the drum carder. I'm getting out lots of itty bitty second cuts, so hopefully this sweater won't pill. That's the plan, anyway!